In light of the recent 50th anniversary of one of the greatest speeches in American history, I believe we can tap into a “greater grace” to advance Dr. Martin Luther King Jr.’s “Dream” and the “Dream” of the Lord Jesus Christ in John 17, that we would be one. I believe there is something beyond the normal talking points of our ideological entrenchment that is available to the humble. In my dream, I still see the Church (or better said, the servants of Jesus Christ) as the best answer for all that is wrong in the world today. However the Church needs to admit we have missed the mark when it comes to reconciling the races and the denominations. Some of our Sunday morning separation is not wrong; it’s just a matter of cultural preferences similar to the variety on our radio dial. I love the honesty of a black minister in my city. He said, it isn’t that he doesn’t like white people, he just prefers to be with black people. People like certain genres of music. It’s not often you will find country, blues, jazz, hip hop and rock music all on the same radio station. Freedom to choose your preference is a good thing. However when we never interact with people different form us between the Sundays, when we don’t cross pollinate, when we only have relations with our “own kind or family” the offspring we produce can have “birth defects”. Our mutual isolation produces psychological and sociological genetic weaknesses that keeps us from reproducing healthy solutions the next generation needs. We have lost the ability to balance differing points of views, that enables us to walk the “narrow path” that leads to life in our nation. The Church of Jesus Christ is the only authorized and empowered people on the planet that can bring true reconciliation to mankind. The God who reconciled sinful man to Himself through Christ has deputized us as ministers of reconciliation, in all its forms. However the Church needs to be reminded that the Church isn’t the pattern for the Church… Jesus is the pattern. We are to offer the essence of Christ Himself, not the religion about Him. We are to be Jesus with skin on. That requires us to embrace the crucified-life so His life can flow through us. I believe He is with us today, speaking through people who are willing to yield to His Spirit, whether in the local PTA meeting or at your work place, in the White House or in God’s House. We sometimes forget that Jesus didn’t come to earth to bring a religion; He came to bring a Kingdom. His kingdom is not political, but it is governmental. He still administers His kingdom rule here on earth, one life at a time. Often it’s only those who are broken, “kingdom minded believers” that possess the essential grace to advance the conversation we need so desperately. We need to be aware of the powerful vortex drawing us into the same trap set by the religious leaders of His day. Will we stay stuck by repeating the same old talking points that keeps us separated or will we mature in Christ-likeness to find new solutions. Let’s tap into His grace to advance the conversation that is available to the peacemakers, and we will see the Dream come true. I have a dream we will not be political snake breeders. I have a dream we will be free from doing things the way Barabbas did. 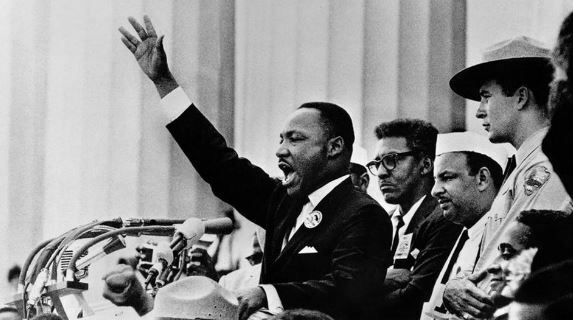 I have a dream we will find life amidst a larger, balanced theological perspective. I have a dream we will bury the excuses that keep us from working together in our cities. I have dream we will humble ourselves and let God take over as never before. I have a dream we will find a better way to govern by seeing things from a third perspective. I have a dream the Church will understand the bigger picture of how we are to reach maturity. I have a dream believers will understand how apostles, prophets, evangelists, pastors and teachers can get along. I have a dream the transition the Church is experiencing nationally with turn into another awakening. Posted in Most Popular Articles and tagged Body of Christ, Denominations, Jeff Krall, Kingdom of God, Leadership, Martin Luther King Jr., Maturity, Unity on August 28, 2013 by Jeff Krall. ← Jesus or Barabbas – Which “Son of the Father” Are We Following?